Magnetic panels are a simple, cost effective alternative to permanent vinyl graphics. Unlike permanent vinyl graphics, magnetic panels can be easily removed and refit onto your vehicle when needed. Therefore if you are looking for a quick and easy way to temporarily brand your vehicle, for advertising purposes, magnetic panels are ideal for you! 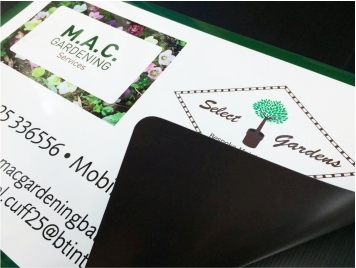 Our magnetic panels are supplied in pairs and are produced onto vehicle grade magnetic vinyl. They are custom made in a variety of different sizes and can be printed with just text or full colour graphics. For more information and to request a custom quote for your vehicle, please contact us.